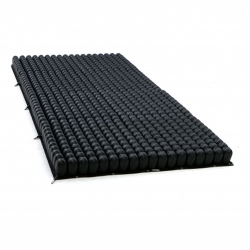 The ROHO DRY FLOATATION Mattress Overlay System is the original non-powered, adjustable, and reactive support surface mattress overlay for people who require skin/soft tissue protection or have other therapeutic needs. This mattress overlay is comprised of 4 sections with 720 air cells for greater conformity and better pressure distribution. Each section measures 33.75" x 19.25" and easily snaps together to create one mattress that is 33.75" x 75" x 3.25". Additional sections may be purchase as replacement parts as needed. The DRY FLOATATION mattress overlay system provides individualized pressure, shear and friction management through force redistribution to an individual's shape. Requires no electricity to operate and transports easily when needed. Total weight is 32 lbs. Ideal for use with at risk patients due to skin breakdown and deep tissue therapy. This mattress overlay also works well with any stage pressure ulcer, skin grafts, myocutaneous flap surgery or pain management program. Includes: DRY FLOATATION sections (4 sections per overlay system), registration card, hand inflation pump, repair kit, operating, instructions and cover. Excellent overlay which suits my Dads needs and is very lightweight and portable. We had tried others with no success but this one is fine for him . Good delivery time and Active Mobility certainly know their products, when I rang for advice before ordering . Nice to deal with people who don\'t just hard sell.